At least 15 people dead in Pakistan as fresh protests erupt across the Muslim world against film and cartoons mocking Islam. At least 15 people died in Pakistan on Friday, as fresh protests erupted across the Muslim world on Friday against a U.S.-made film and French cartoons mocking Islam. AFP reported that tens of thousands took to the streets after the main weekly prayers in Middle Eastern and Asian countries to vent their anger, with little sign that the angry protests which began last week would abate. Western missions were shut across the Islamic world, the report said, fearing further escalation of the backlash over the low-budget film "Innocence of Muslims" that has spread across the world. France, where a magazine this week published a series of cartoons mocking the prophet Mohammed, has shut embassies, consulates, cultural centers and schools in 20 Muslim countries, fearing the fury will spread from U.S. targets. Pakistan bore the brunt of the anger Friday, with huge crowds of demonstrators throwing stones and setting buildings ablaze to denounce the film. There were clashes in the country's five largest cities leaving 15 dead and 219 others wounded, as protesters defied government calls for peaceful demonstrations on what was declared a national holiday in honor of Mohammed. Witnesses estimated that nationwide rallies mobilized more than 45,000, mainly members of right-wing religious parties and supporters of banned terror groups. Police fought back with gunshots and tear gas as arsonists and looters attacked cinemas, banks, shops and restaurants in Karachi, where outbreaks of political and ethnically-linked violence have killed hundreds this year. Two cinemas were also torched and ransacked in the northwestern city of Peshawar, on the edge of tribal belt strongholds of the Taliban and Al-Qaeda, AFP reported. In Karachi, a policeman who died after being shot when officers used tear gas to disperse a crowd near the U.S. consulate was among 10 people killed in the country's largest city. Five people were killed in Peshawar, including the driver for a TV channel which blamed police for his death, said the AFP report. Police and paramilitary troops deployed en masse fired off volleys of tear gas to hold off protesters from breaching barricades that sealed access to Western embassies and consulates. In Islamabad gunshots were also fired outside the five-star Serena Hotel and police baton-charged some 8,000 protesters trying to penetrate the heavily-guarded diplomatic enclave. 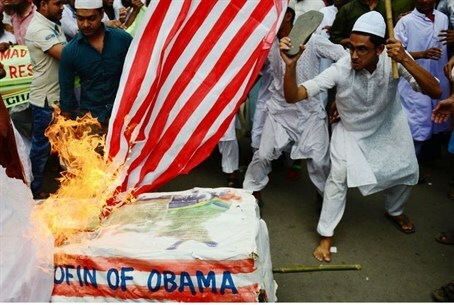 Protestors threw stones, shouting "Americans are dogs" and "Friends of America are traitors", while setting fire to an effigy of a nameless American. Meanwhile, U.S. Secretary of State Hillary Clinton on Friday reminded governments of their "solemn duty" to protect diplomatic missions, saying that "they must be safe and protected places". While the protests turned ugly in Pakistan, in other Muslim countries there was no serious violence during demonstrations, AFP reported. In the Arab world, Sunnis and Shiites took to the streets of Lebanon, while there were also demonstrations in Basra in south Iraq and in the Yemeni capital Sanaa. Tunisia had banned all demonstrations amid fears of violence and Libya's second city Benghazi braced for rival demonstrations by a jihadist militia and its opponents.